Knowing the “right channel” (combination) is just one (key) part of a customer-centric omnichannel strategy. Including other critical dimensions - notably “right content”, “right context”, and “right frequency” – has never been easy. And mapping these onto who the right customer is, and how to benchmark your competition in markets, is a challenge that is only growing. The Across Health Navigator 3.0 delivers easily navigable insights into all of these components – as well as giving a thorough survey of the third party media which physicians in different specialties and markets use. This final component allows a solid basis for evaluating websites, newsletters, apps, congresses, and online communities. The biggest tech companies in the world are also the best at customizing their offerings for customers, and predicting what they want. Amazon, Google, and Netflix have been consistently using AI and predictive marketing analytics to first achieve and then maintain their supremacy. Their internal knowledge, matched with large quantities of structured data and a laser focus on what ‘good’ looks like, have been the drivers of their success. • How does predictive analytics differ from prescriptive analytics? • When can predictive analytics become relevant (and when not)? • What are the different enablers for engaging in predictive analytics? Join us to find out about the results of the 2017 Multichannel Maturometer. The ninth version of this industry-renowned survey illuminates some of the big changes sweeping through the Pharma industry, as well as highlighting some trends which are still lagging. • Is senior leadership still on the fence for digital? • Marketing budgets – how are they changing? • How satisfactory are those in the industry finding digital offerings? The world of the field force is changing. Increased digitalisation, powerful new tools and a growing expectation that they ‘conduct’ multiple channels means new skills, ways of working, and even thinking, are needed. This shift will radically change the structure of the traditional Pharma organization. Differences between HQ and local offices will become less pronounced as the field force gains the ability to deploy highly tailored, right-on-time content, in the best possible format for individual physicians. Find out more about how the time of the Multichannel Rep is now, how upskilling and reskilling are the buzzwords for new engagement models, and how not to have your field force being left behind in the digital race! Life Sciences is an industry full of established, large companies with significant barriers to entry and often long legacies of success. But the weather is changing – and the structures and strategies which have kept these enterprises safe may soon become liabilities. What is only just becoming clear, though, is how fast this is happening. Along all key areas of the value chain, new & nimble competitors are entering the scene - and they are playing a totally different game. Find out more about these disruptive trends, get the highlights of our second ‘Healthcare Disruption Tour’, which went to the heart of the action in Jan 2017, and learn why pharma should take note…and how it can best prepare & organize for this tsunami. Adding a practical and in-depth view on individual channels to a holistic view on pharma’s communication landscape. Peter Hinssen, Chairman Nexxworks and Fonny Schenck, CEO Across Health. •What are the key technology trends & revolutions that can disrupt the life sciences industry? •How do you embed disruptive innovation in your own organization? This webinar will provide you with an overview how digital can be integrated into medical plans and what it takes to deliver multichannel medical excellence at launch. -What did we learn during the Healthcare Disruption Tour? 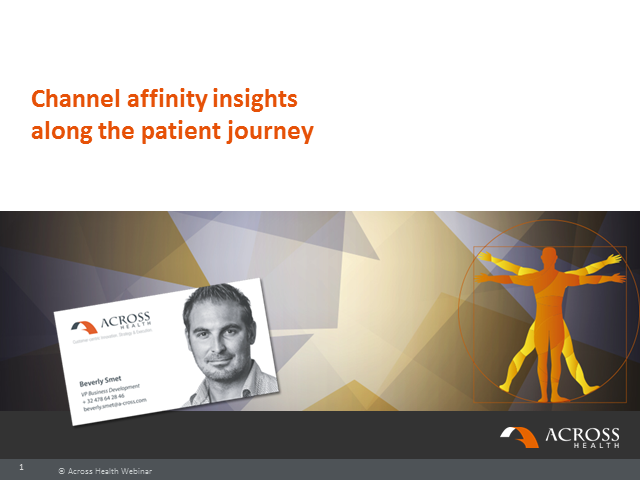 * How to engage with your patients in a multi-channel environment. •Optimally segment patients in the digital age. •Determine the ideal patient channel-mix. •Measure the success of patient-centric programs. Key insights on Marketing Automation in Pharma, presented by experts of Across Health. - How are other markets using this technology? - Our observations and learnings in the Life Science industry. - Identifying the challenges of implementing Marketing Automation for your organisation. Key insights on mHealth and Disruption in Pharma, presented by experts. •How do new technologies disrupt industries? •Why does the network always win? •What are some key trends in healthcare technologies? •How can pharma leverage these trends? What is your multichannel maturity vs industry average and vs best-practices in leading industries? What’s your 3-year strategy for the customer-centric New Normal? How do you set up an agile internal network to deliver a consistently great customer experience? How do you assess whether you are moving in the right direction? Across Health is offering a number of interactive live webinars for free. No travel time or costs involved, just one visit to the Across Health website and you are able to learn more about various interesting topics. Recorded versions of the live webinars are available for those who cannot attend the live webinars.